now that’s a lot of stitches! Started with 376, to be exact – in worsted weight, on 5 mm needles. That’s a 32″ needle, there, with one row of decreases! 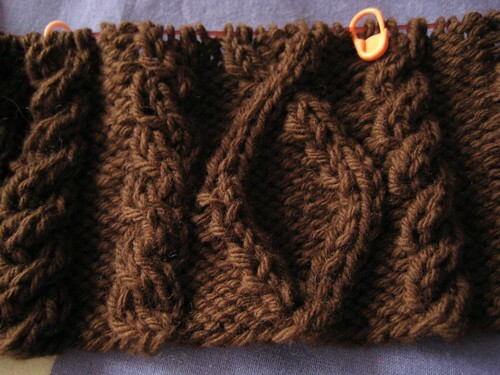 The yarn is O-wool, in a nice chocolate brown. Want a closeup? Yum. The pattern is Silver Belle (Rav link) from the Vogue Holiday issue – it was one of the cover patterns that’s free on their website. I hadn’t really considered it until I saw Zebraknits’ version. I think it’ll be really nice! And all those cables are just plain fun! Yum, indeed!!! I have this pattern in my favs. Can’t wait to see yours. The chocolate brown is divine. Yes, the very one I saw that made me put it back on my to-knit list. I knew as soon as I saw your first photo. What other current pattern has cables that go sooo far around? The O-wool is gorgeous, as is your cabling. Wow – that is gorgeous! 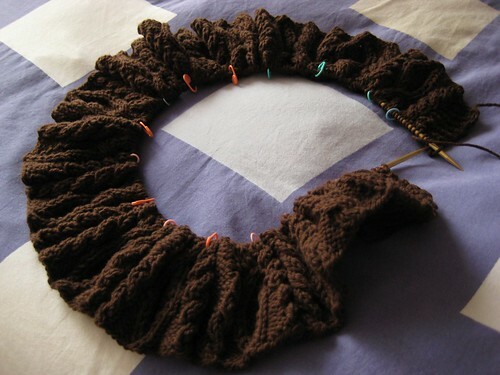 The cables are amazing and that chocolate brown is so rich. I love that sweater! Can’t wait to see your version! How beautiful! I love the richness of the brown cables! How nice cables ;)Great colours -mmmm chocolate :) It looks great :) Where did you get those orange stitchs markers? Beautiful color and pattern! Thanks for the pattern link – I received a bunch of O-wool for Christmas and may make this if I have enough. Thanks! Found you via Green Apples!